We recently came across The Fort Makers, a group of artistically gifted friends in the creative center of Brooklyn, New York. Calling themselves “urban folk artists”, they are a great example of artistic collaboration and speak to the notion, two heads are better than one. The collaboration was started in 2008 by Founder Nana Spears with artist Naomi Clark and Noah James Spencer. 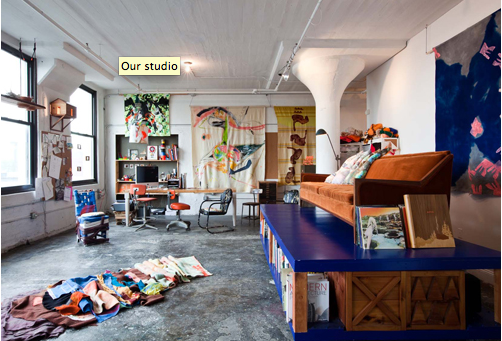 With their backgrounds in fashion, art and design, their first collaboration was re-making old wool camping blankets. By re-cutting and re-dying, they provided a new context and a new life for an old item. Their artistic energies have continued to branch and grow and are currently exploring the canopies of fashion and wearable art with their current collaboration, The Dress Project. Fort Makers’ artist Naomi Clark, creative director Nana Spears, and fashion designer Lauren Nevada are behind The Dress Project; a collection of hand-painted silk and cotton dresses. 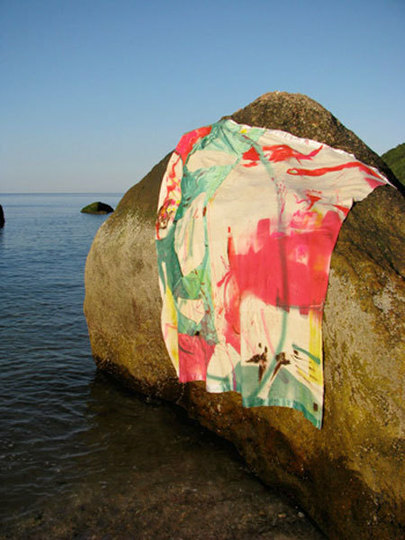 No different from a canvas or a blank wall awaiting a mural or the designs of a curious child, Naomi Clark creates abstract, dreamy, and emotional imagery on the entire bolt of fabric of which dresses are designed and made. Each dress is unlike any other, but a distinct piece of the original whole. Not only do we LOVE the idea of art meets fashion, but we LOVE the color palette of the dresses for Spring 2011. The easy style of the shirt dresses are a natural fit for the Spring wardrobe and will also be a collector’s piece to have in your closet for a lifetime. They will look amazing with Spring’s bright accessories and you can go modern or crafty with the jewelry. All of the dresses are one of a kind and made to inspire. Yesterday Fort Makers celebrated the debut of The Dress Project at Bird in Williamsburg, New York. The boutique also serves as a gallery space displaying works from Fort Makers’ first project, The Blanket Project, as backdrops and curtains. 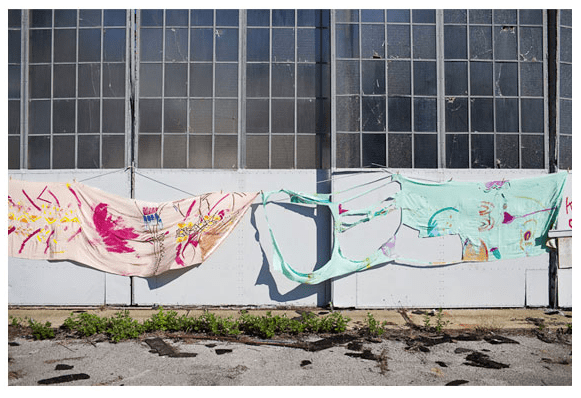 Similar to The Dress Project, the artists use old wool camping blankets they salvage from eBay, garage sales and flea markets as their initial blank canvases. 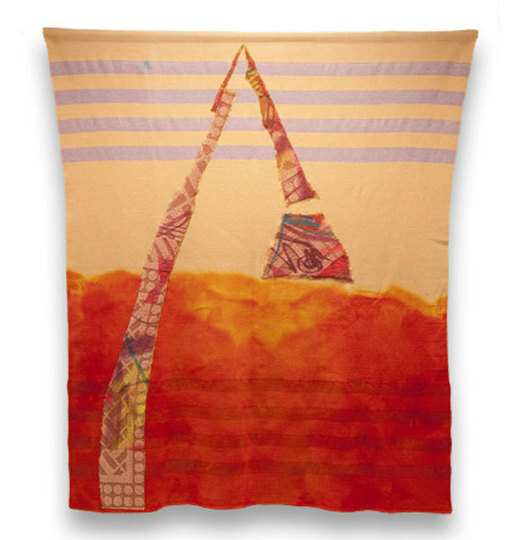 The blankets are cut, dyed, and quilted as the artist sees fit, creating re-worked textiles. Pieces from this project will be on display at Bird Williamsburg through the month of February. The dresses retail for $745 and can be bought at Bird and Louis of Boston. To see more examples of their work, check out FortMaker’s creative website here. holy crap i’m in LOVE. keep up the good work this is awesome. love it!!!!!!!!!!!!!!!!!! !